Arguably the region’s best prep distance runner did it again. 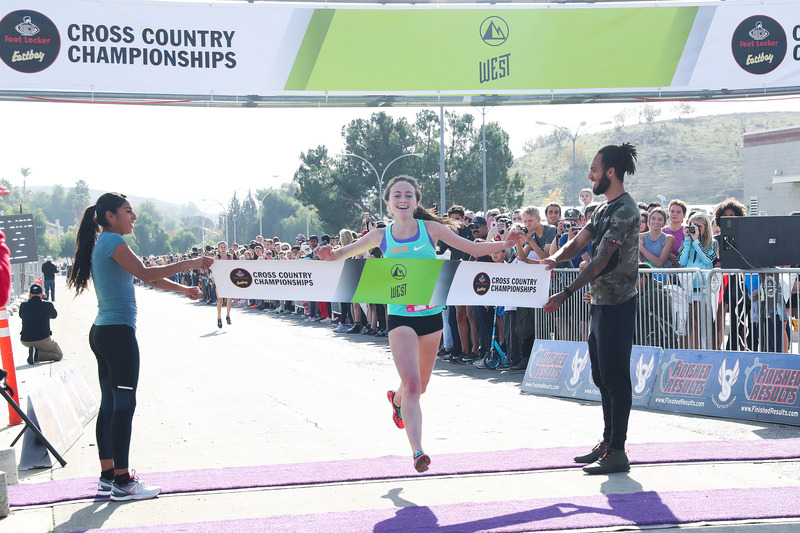 This time, Kristin Fahy, a senior at La Costa Canyon High School, ran away from the field to win the 5,000-meter race at the Foot Locker Cross Country Championships West Regional on Dec. 1 at Mt. San Antonio College in Walnut. With the win, Fahy qualified for the Dec. 8 Foot Locker Cross Country Championships National Finals at Morley Field in Balboa Park. Only the top 10 in each the boys and girls divisions qualify for nationals. The regional race featured many of the top runners from as far east as Utah, west from Alaska and Hawaii and up the Pacific coast. Fahy won with a time of 17 minutes, 52.8 seconds, just five seconds faster than Allie Janke, a sophomore from Spokane, Washington. Meanwhile, Sage Creek High School junior Skyler Wallace finished 16th with a mark of 18:38.4 followed by teammate Stormy Wallace, a freshman, who came in 20th (18:44.5) and Lavanya Pandey in 71st (19:37.1) and Natalie Huestis in 107th place (20:42). Both are juniors at Sage Creek. For Fahy, the trophy was another win on an already growing list of accomplishments. She won the Division II state championship in cross country on Nov. 24 with a time of 17:22.6, which was 22 seconds faster than the runner up. Fahy’s run was the second fastest in the state this year, less than three seconds behind Tori Gaitan of Great Oak, who won the DI state title with a mark of 17:19.4. Fahy won all but one race this season notching a personal best time of 14:59.1 at 2.75 miles (typical high school cross country races are 3.1 miles) on Sept. 15. At the CIF San Diego Section Finals, she blew away the field, crossing the line in 16:57.5, while teammate Jessica Riedman came in second with a time of 17:51.6. Fahy led the Mavericks to the CIF San Diego Section championship as four La Costa Canyon runners took the top four spots — Kyra Compton (third) and Sydney Weaber (fourth) — and Natalie Schroeder placed 13th. La Costa Canyon placed fifth as a team at state.